As good as the plastic models are, a Ukranian company is promising its new kits will be the finest and most beautiful kits you can buy. Rather than simply clicking together, Time for Machine’s models are made of very thin metal, produced using an innovative chemical etching method. The result is a stunningly reflective surface, with oval side edges to ensure safety. The parts come in a sheet, ready to be separated by hand. The only tool needed for assembly is a pair of small pliers, ready to bend some tabs to keep parts in place. Instructional videos guide you through every step to ensure an impressive final model, but where’s the challenge in that? Yes, these models move, using either an included mechanical engine or spring-wound power system. Each model lets you interact with all the details, and watch the gears and motors working away. Don’t expect to see the models motoring along like a radio controlled car though – there’s only enough energy in the spring to push things along for five metres or so. Car fans might appreciate the ‘Royal Voyager’ model most. Looking like a 70’s American sedan, there’s opening doors, trunk and hood, as well as a roof that comes right off. It’ll look great on an office desk, but don’t wind it up and send it flying off the edge. 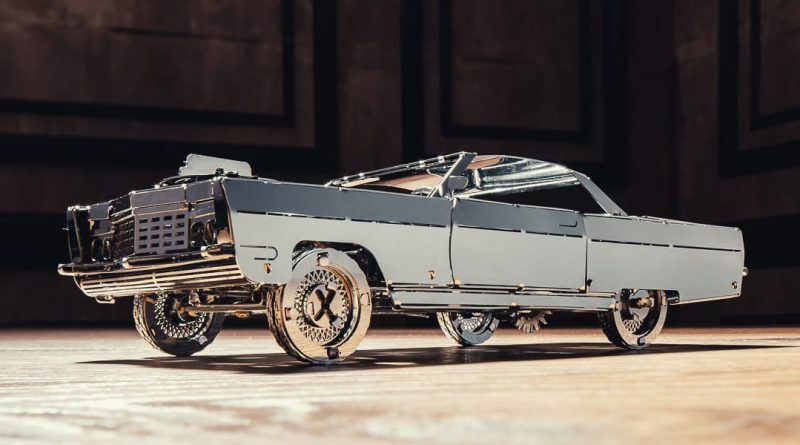 The Glorious Cabrio model mimics the finest luxury cars of the 30s, with its long hood and hidden drive mechanism.There’s even a steering wheel that rotates the wheels. The Silver Bullet recreates racing cars of the early 20th century, with a spring powered motor under the opening bonnet, and even exposed tie rods at the front. It’s not all cars though. The famous Spruce Goose aeroplane is recreated in an enormous set, while a steampunk-style locomotive brings drama to the models. You can even choose a tractor or tank to recreate, all as simple as each other, if somewhat different in size. Sadly, you can’t just go and buy one of these though. Instead, Time for Machine is raising funds on Kickstarter to start production and distribution. As this goes to press, the target has been smashed, so it’s a near certainty that the models will come to fruition and, with prices starting from around £25 for a tractor, it won’t break the bank. Our favourite, the Royal Voyager, will set you back around £43, while the Spruce Goose goes for a more significant £64. The Dazzling Steamliner tops the range at £85. To help fund this project, visit Kickstarter right here and pledge your support.